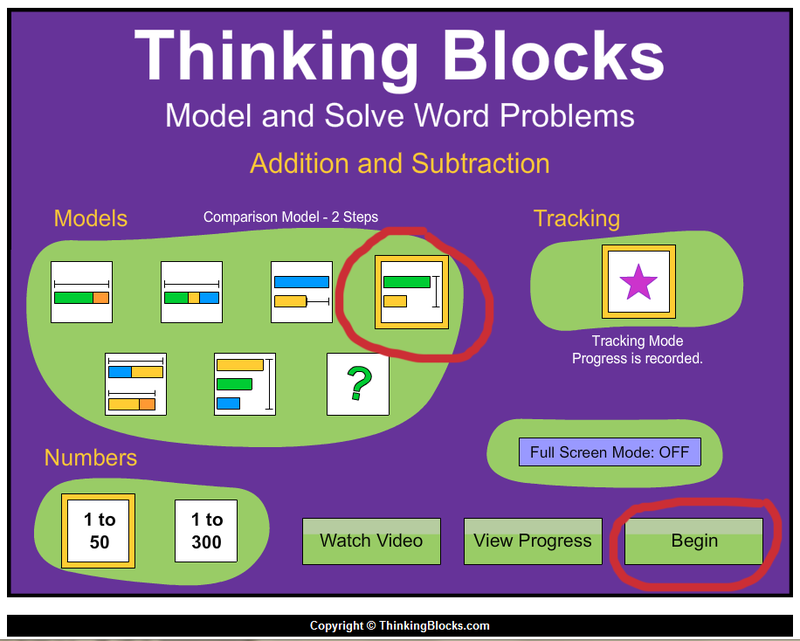 I attended a Math in Focus/Singapore Math workshop on using bar models for math problem solving this past week. It was a good training in that the speaker was very engaging. 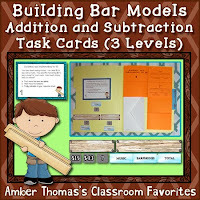 In the afternoon I got to show off my fourth grade bar modeling skills (some people prefer algebra for problem solving, but my brain is without a doubt wired for bar modeling). 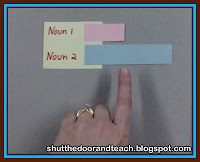 I even got to show off a system I developed for making the bar modeling strategy more concrete for kids using just Post It Notes and paper strips. It really helped get my kids into the problem solving mindset at the start of the unit this year. You can read that at this post. The problem I had with the training (other than the fact that we had already just finished the chapter) is I didn't feel like I learned any strategies for helping struggling students. It's been emphasized that we need to give kids time and space to learn how to persevere with novel problems. And I understand the gradual release of responsibility; at some point they need to hear, "You try it now." But is it reasonable to give novel problems to every nine year old? I keep thinking back to my college professor who said, "Telling kids 'think harder' is not going to help them." The missing link was a way to get kids practicing more in an engaging way, to build up their skills for those kids who just haven't arrived when it comes to preserving through novel math word problems. And then I found Thinking Blocks. I love this program because it's free, it's differentiated, and it gives so much immediate feedback to kids as they are practicing. 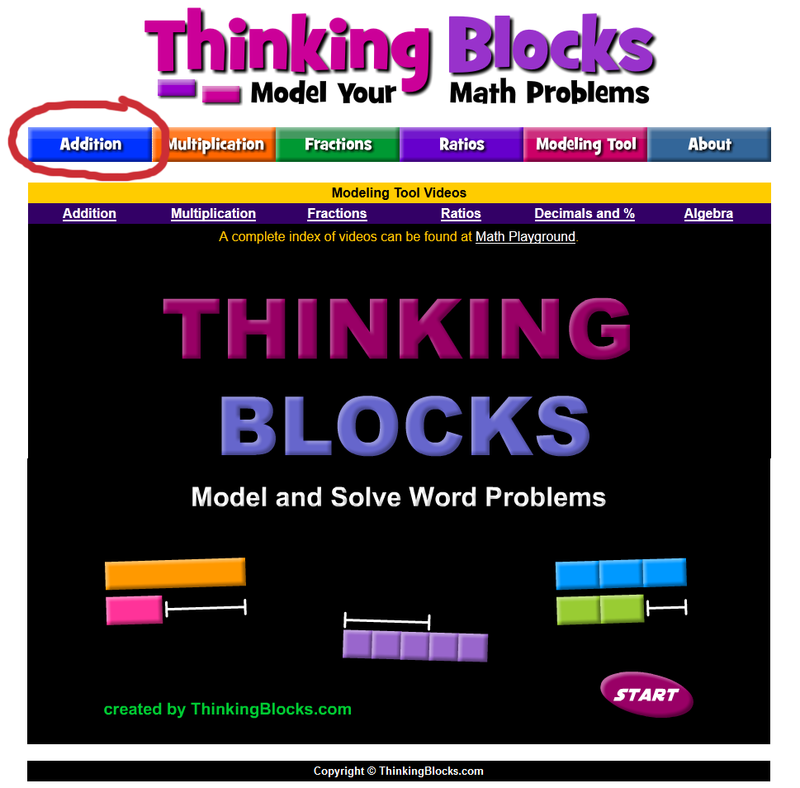 For fourth grade, I just clicked on "Addition" near the top (don't click on "Start" at the bottom; I didn't find that activity useful). This problem has 5 separate points in which kids are deciding where to move pieces, with a hint at each step, and then click "check" to make sure they are on the right track before proceeding. They start to see that they aren't going to get an answer in the first screen; a single problem requires a fairly lengthy procedure, even though each step in the procedure is not terribly difficult. They have to solve 5 similar problems to "beat the level." I think that's plenty of practice, and they love seeing their achievement page filled with a row of stars. When I introduced this site to my class, they were excited about the overall look of it. Once they actually sat down to play it, I saw kids who felt confident, not sitting stuck. I saw kids who are not proficient in computation excitedly working through the numbers before typing in their final answer. And when I said, "Okay kids, our computer lab time is half over. 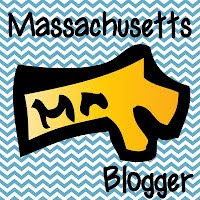 If you'd like to exit this activity to have some time to read and reply to our classroom blog you may," most kids asked, "Can we stay on this site instead?" 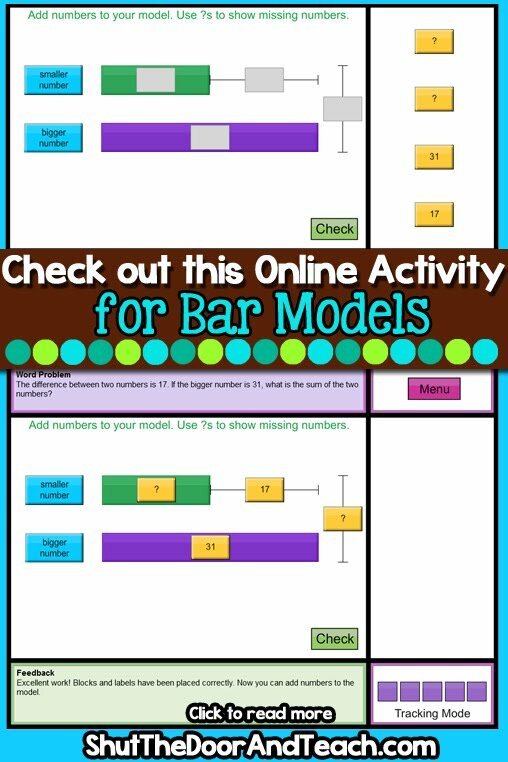 Our school still only has computers once per week, so we continue our practice on paper during math using this bar model activity. 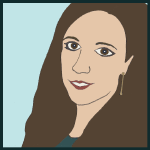 Do any of you teach Singapore Math? 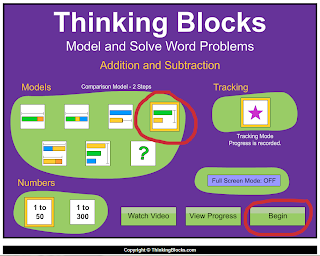 What tricks to you have to help kids become more comfortable with demanding word problems? You're very welcome! 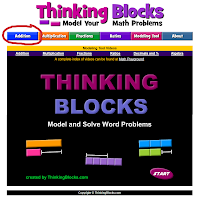 How could I NOT share; my students LOVE this site and it's FREE! They struggle so much with the process of problem solving and this breaks it down so perfectly for them. It's such a great way to scaffold and build their confidence prior to independent work on multi-step problems! 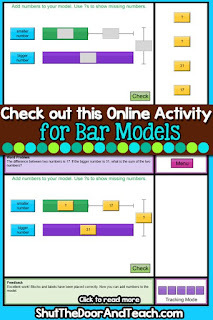 I just purchased Bar Models for my third grade math class. I want to use them effectively to enhance my struggling students in math.